Great Tastes Tuesdays! 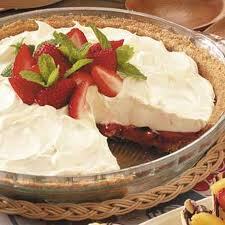 : Strawberry Cheesecake Pie, Christmas & Sweepstakes! Strawberry Cheesecake Pie, Christmas & Sweepstakes! It's Tuesday! And this is our recipe find for the week! but sometimes it is just a little too rich for you - try this combination. This tastes great, but isn't so thick and rich that it is too much. The strawberries at the bottom bring a fun surprise for those who don't know they are there! Also, here are some fun Christmas ideas to make for your home! In a bowl combine your strawberries, almonds and sugar. Pour this into your crust. In a mixing bowl, beat your cream cheese until it is smooth and gradually add in ½ cup of your milk. Add the pudding mix and remaining milk with the cream cheese and beat for 1 minute or until it is well blended. Pour this over your strawberries that are already in your crust. Cover your pie and refrigerate for at least 2 hours or until it is set. You can put your whip cream and strawberry slices on top if you would like. * 2 pieces of fabric that are measured 14 x 20 inches. * Fringe 2 pieces 14 inches long for each place mat. * Batting you would use in a quilts 14 x 20 inches for each place mat. 2. Cut out your fabric, fringe and batting. 3. Pin all of these together how they would be when you sew them together. rectangles around the outer edges and then swirls in the center. 5. Now iron all the sides under 1/4 inch and pin it all together. 6. Pin you fringe inside to the two shorter sides. 7. Now sew all the way around your place mat. 8. You now have a pretty place mat! * You can use any kind of material to go with any holiday or occasion!!! 1. Measure the back of your chairs at your house - the width and the length. Don't forget a white ball to use for the top of the hat! 4. Trace this pattern onto your material and cut out two sides for the hat. that will fit the hat. entire hat to complete it. 7. Don't forget to finish it with a white fluffy ball on top! Fun to have for the holidays! Win a handcrafted table runner for Valentines Day! + Plus there will be a second and third place prize! Rules: There are many chances to get a chance to put your name in the drawing. The first and the easiest way is to find us on face book ( Great Tastes Tuesdays ) and "Like" our page. This will give you your first chance to get your name in the drawing. The other way to get your name in the drawing is to come on our blog and make a comment on any of our posts. At the end of each post put your first name and last initial. You can post up to 10 comments!! These comments may be about a recipe that you have tried on our blog and want to write about, something you want us to improve on or see different on the blog, or maybe a recipe you would like to see on it. Any suggestions would be greatly appreciated - and hopefully keep them positive comments. Last but not least email us your first and last name and your email address underneath it. This won't be used for anything else but to contact you if you win. If you don't do this last step, and you win, we won't be able to contact you. So, "Like" us on Facebook and write up to "10" comments on our blog gives you "11" chances to win in our Valentine's Day Sweepstakes drawing! Stay in watch on our blog too! There might be even more chances to get your name in the drawing before January 22nd 2013! The last day to post a comment will be Tuesday January 22nd 2013. We will draw for the Sweepstakes the next day on Wednesday January 23rd 2013 and contact the winners then. Post comments today! We would love to hear your input! And maybe you will even see something on our blog that you may have suggested.